The ability to observe and wrest tension through the mundane is a prominent aspect of Ti West’s The Innkeepers. The film falls right in line with his previous effort, 2009’s The House of the Devil, with the two encapsulating a particular mood found in 70s horror films that value the virtue of tight suspense-building and character development. 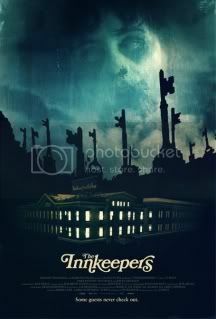 The Innkeepers also adheres to West’s impressive ability to view the architecture as a potential outlet for fright. Much like creaky house found in The House of the Devil, The Innkeepers benefits from a very clear understanding of its haunted playground. Taking place at The Yankee Pedlar Inn, the spirit of Madeline O’Malley functions as the film’s obligatory ghost story. It’s this sort of foundation that allows West to develop an intriguing framework for his characters to inhabit. West simultaneously subverts and adheres to horror conventions of ‘ole in an attempt to play around with audience expectations. What made both The House of the Devil and The Innkeepers so interesting is the way in which West handles his female characters. Much like with Jocelin Donahue in The House of the Devil, Sara Paxton leaves an incredible impression on you in The Innkeepers. As the film detours from its exploration of the paranormal, West gives his characters the opportunity to really develop a personality. Scenes that seem to go nowhere, like when Paxton attempts to toss out a dripping bag of trash into a dumpster, is the sort of goofy sight that becomes really valuable in warming up to her character. Similarly, Paxton and her co-star Pat Healy develop quite the rapport, particularly in their drunken musings and observations on the state of their life. It’s these scenes, scenes that carry a melancholic tone and observe characters in internal duress, which make The Innkeepers more interesting that you’d expect. Unfortunately, the film bares some unusual problems that simply can’t be overlooked. Whereas West relished in extended sequences of exploration in The House of the Devil, he seems to be cutting back in The Innkeepers. Suspense is definitely built, but there are certain limitations that prevent the audience from getting a greater sense of the spatial setting of the hotel. This becomes especially clear in the way West positions his camera – there are a series of bizarre tracking shots and obtuse angles that feel superficial. Whether this is due to the confining nature of the hallways or limited room in which he has to frame characters is unclear, but on a technical level, the picture is a bit of a disappointment. Regardless, the picture is effective as a sort of off-beat rom-com horror, though there’s slightness to the work outside of Paxton’s presence. West has the sensibility – at this point it’s a matter of refinement.